Few would argue the fact that the brakes are the greatest safety feature of any vehicle on the road. However, for them to remain so, the brakes do require regular maintenance from time to time, much like any other system on cars, trucks and SUVs. So how do you know when it is time for brake repair? Here are six symptoms of trouble that will let you know it's time to head to the auto repair shop. Noisy brakes are a sure sign trouble. This indicates that your pads have worn down completely and metal is grinding on metal. This greatly reduces your ability to safely slow your car. If you hear any odd noise when you hit the brake pedal be sure to head to the mechanic right away. If the brake pedal seems soft and has little resistance, or if it fails to return to its normal resting position after hitting the brakes it may mean there is a loss of pressure in the system. There is a good chance there is air in the brake lines or there may even be a brake fluid leak. The best you can hope for in this situation is worn down pads that require you to push harder on the pedal to get a reaction. Your car shouldn't jerk left or right after hitting the brakes, if it does there is a good chance of uneven brake pad wear. This issue can also be caused by impurities in the brake fluid or a stuck wheel cylinder. This pulling sensation is a dangerous control issue that needs to be addressed. A vibration that occurs in the brake pedal as your slow down generally indicates warped brake rotors, which is the part of the brake system the brake pads rub against to create the friction to slow your car. If they are warped the surface area available to the pads is reduced, lowering your braking ability. Never drive your car if you notice a clearish brown liquid dripping from the wheel cylinders or brake master cylinder. A loss of brake fluid could cause complete brake failure. Call for a tow truck instead of driving to the shop, to ensure maximum safety. Perhaps one of the first signs of trouble you will encounter is the ABS light on your dashboard. ABS stand for antilock braking system, and if the light comes on a sensor is detecting some sort of issue that needs to be properly diagnosed by a repair technician. Never hold off on having brake trouble diagnosed and repaired. It is your responsibility as a vehicle owner to keep your car in healthy condition. 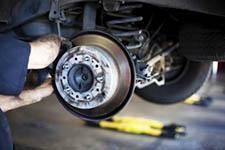 For professional brake repair in Sacramento reach out to Freeport Automotive. Our expert auto repair technicians will ensure your vehicle is safe and reliable to drive. Give us a call at (916) 389-2405 to request professional auto repair in Sacramento today. We look forward to servicing your import or domestic vehicle.